Davao is the gateway to the southern Philippines, a hub of commerce, and industry in the southern Mindanao region of the Philippines. Although as an urban metropolis Davao has little to recommend it, the attraction of the city is its proximity to a beautiful surrounding landscape of hills and fertile valleys, dominated by the massive, 9,692 foot (2,954m) Mount Apo, a potentially active volcano that stands as the Philippines's highest mountain. Many indigenous tribes still inhabit the valleys outside Davao, such as the Bagobo, Manobo, Mandaya and Bilaan. Davao is the centre of the Philippines fruit and flower growing region, and an annual festival (the Kadawayan Festival) is held in August to celebrate the bounty of the fields. 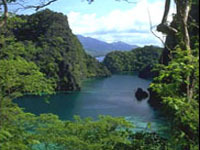 The region is also home to the endangered Philippine Eagle, and the rare Vanda Sanderiana orchid. Like the rest of the Philippines, of course, the Mindanao region and its many islands also offer thousands of tropical beaches and dive sites, many of which are accessible only to intrepid travellers. The Mindanao region is sadly still considered unsafe by most travel authorities due to the high threat from terrorism and piracy in the area; those visiting Davao should plan their travels carefully to ensure maximum safety, especially in remote areas.